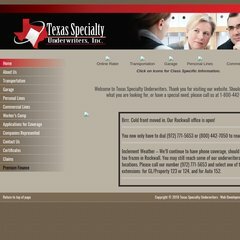 texasspecialty.com Texas Specialty Finance, Inc.
ASP.NET is its coding language environment. It has 2 DNS records, ns79.worldnic.com, and ns80.worldnic.com. It is hosted by Crystaltech Web Hosting Inc (Arizona, Phoenix,) using Microsoft-IIS/6 web server. PING www. (209.200.93.76) 56(84) bytes of data.